Notification No. 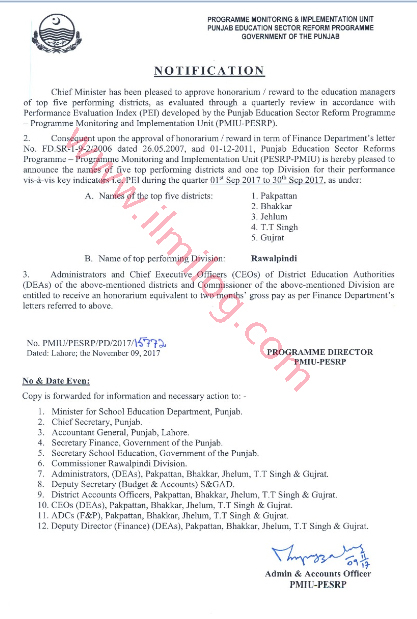 PMIU/PESRP/PD/2017/15772 is issued by Program Monitoring and Implementation Unit PMIU Punjab Education Sector Reform Program PESRP Government of Punjab dated 09-11-2017 regarding Notification of Two Months Gross Pay Reward to Education Managers of Top Performing Districts. 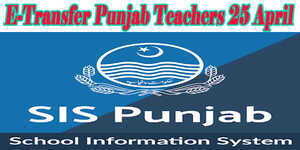 Chief Minister has been pleased to approve honorarium/ reward to the education managers of top five performing districts as evaluated through a quarterly review in accordance with performance Evaluation index PEI developed by the Punjab education sector reforms program PESRP & Program Monitoring and Implementation Unit PMIU. Administrators and chief executive officers CEOs of District Education Authorities DEAs of the above-mentioned districts and commissioner of the above-mentioned division are entitled to receive an honorarium equivalent to two months gross pay as per finance letters referred to above.